Farenholz's Rule (originally proposed in 1913) posits that parasites and their hosts speciate in synchrony. This process, the joint speciation of two or more lineages that are ecologically associated (coevolving), has since been termed cospeciation (or parallel cladogenesis). While most research to date has examined parasite-host interactions, other coevolutionary relationships may also exhibit cospeciation; however, we will focus on parasites and hosts for this discussion. Parasite tree host lineage, or failure to speciate when its host does. Further, even when concordant, it is possible that one of the groups (often the parasite) has colonized the other (the host) - host shifts might correspond to the host phylogeny because closely related hosts are more liable to colonization by closely related parasites. Comparisons of species' phylo-genies can produce insight (with limitations) into the coevolutionary history of interacting organisms. Thus, as phylogenetic data, and more sophisticated tree-building methods, have become widely available, phylogenies have become very useful in the study of coevolution. A number of empirical studies now, at least partially, support the general notion of cospeciation occurring with some regularity in some parasite-host interactions. Figure 2 Hypothetical phylogenies for host and parasite clades illustrating evidence for cospeciation. 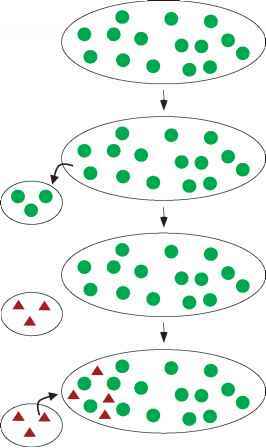 Figure 3 Hypothetical illustration of escape-and-radiate coevolution. In this example, a host lineage has undergone an adaptive radiation after evolving an effective defense against the parasite clade. During this time, interaction with the parasites does not occur. Then, the parasite lineage evolved a counter-defense and also radiated. Because the parasite clade did not cospeciate or colonize each new host in a systematic manner, the parasite-host associations are not anticipated to exhibit one-for-one matching as in Figure 2.
radiation, interaction among the members is minimal or nonexistent. Then, the other member evolves a counter-defense to overcome the innovation and radiates as well, producing reciprocal radiation events among the members. It is believed that diffuse coevolution among plants and herbivores may often follow such a coevolu-tionary diversification process. Coevolutionary interactions may also often produce character displacement (exaggerated phenotypic divergence in sympatry) within local hot spots. This coevolutionary displacement is typically embedded within the broader geographic mosaic of coevolution among species, but may also result in fixation or specia-tion. A number of potential outcomes may result from coevolutionary displacement: character displacement among competitors in coevolutionary hot spots, displacement via apparent competition in hot spots, replicated community structure in hot spots, and trait overdispersion in competitive networks. Such displacement has been demonstrated in numerous systems in nature.